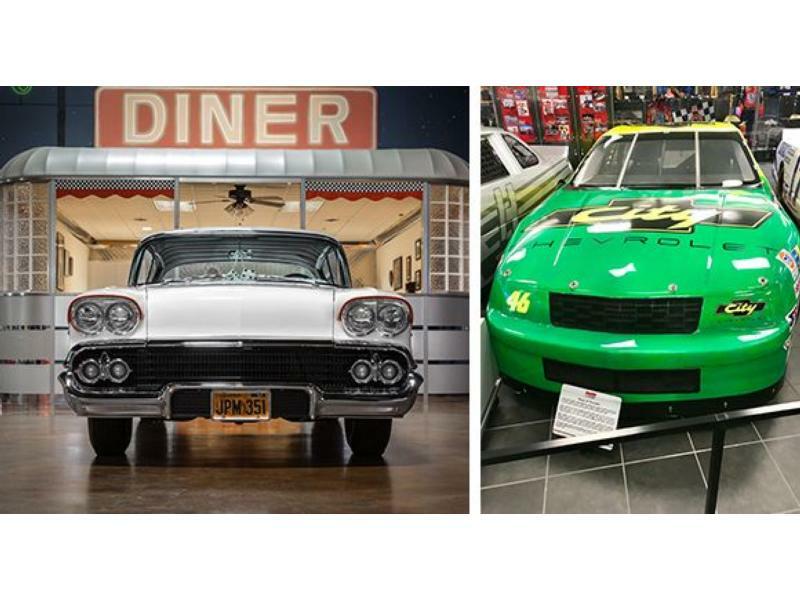 The Ray Evernham-owned 1958 Chevrolet Impala from "American Graffiti," left, and the No. 46 City Chevrolet car from "Days of Thunder" are among the movie- and television-themed cars on display April 5-8 at the Pennzoil AutoFair presented by Advance Auto Parts at Charlotte Motor Speedway. 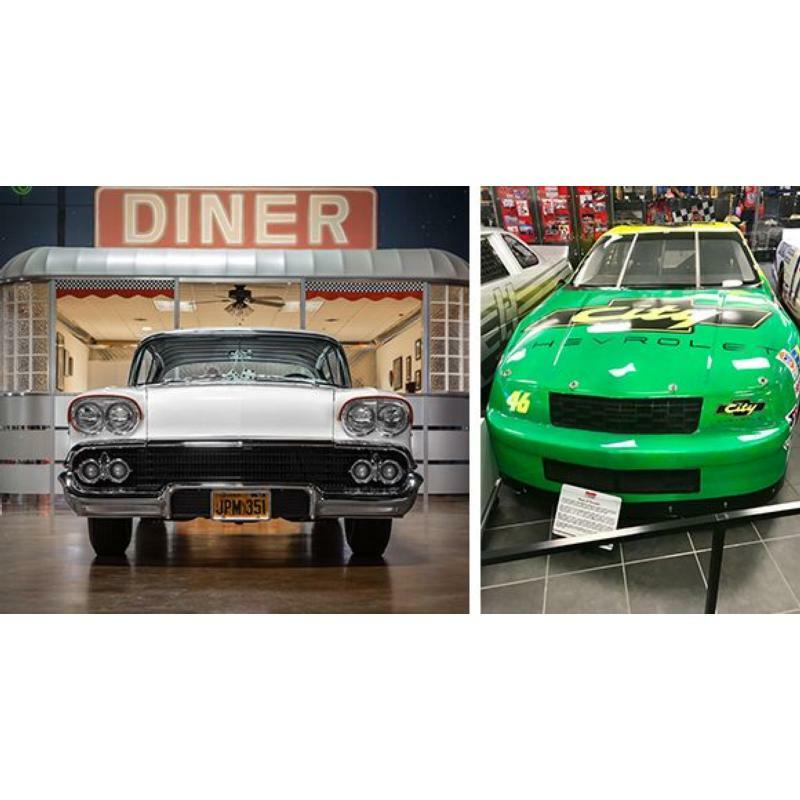 The star of George Lucas' groundbreaking film "American Graffiti," a white 1958 Chevrolet Impala owned by 2018 NASCAR Hall of Fame inductee Ray Evernham, will join the famous City Chevrolet car from "Days of Thunder" in a special movie- and television-themed display at the April 5-8 Pennzoil AutoFair Presented by Advance Auto Parts at Charlotte Motor Speedway. During all four days of the world's largest automotive extravaganza, the "American Graffiti" Impala will be part of a 12-car movie and television display that also includes the No. 46 City Chevrolet car piloted by Tom Cruise's "Cole Trickle" character in "Days of Thunder" - a NASCAR-centric movie released in 1990 that was filmed in part at Charlotte Motor Speedway. Additionally, the 1948 Tucker automobile from "Tucker: The Man and his Dream," and a Ferrari Daytona convertible replica driven by Don Johnson in the world-famous 1980s show "Miami Vice" will share space with a "100 Years of Chevy Trucks" display, custom rides owned by athletes and unique creations featured on Velocity's "ToyMakerz." Released in 1973, "American Graffiti" was George Lucas' second film as director and writer, and it was a monster hit. Lucas made sure the cars in the movie - a nostalgic masterpiece about small-town California life in 1962 - were authentic to the era, with personalities that matched their fictional owners. The story's clean-cut, all-American boy (played by Ron Howard) owned a white '58 Chevy Impala two-door with chrome reverse wheels and pinstripes. Bullet-shaped tail light lenses, such as Cadillac installed on its 1959 models, protruded from the rear like jet exhausts. Its door handles and Chevrolet identification were shaved. The interior was a tastefully modified red and white. Under the long white hood was - according to one of the characters - a 327ci V-8 with six carburetors. When the film's production wrapped, the cars were sold to the public. Since many of them were "20-foot beauties" hastily built and painted for the movie, they did not command high prices. The '58 Impala sold for $325 to a high school student in San Francisco who soon after enlisted in the military and parked it for the next 40 years before Evernham entered the picture. The man who led Jeff Gordon's NASCAR Cup Series team to three championships bought the car and turned it over to his crew for a meticulous restoration that replicated the machine in ways previously thought impossible. The tired engine was replaced with a 327ci V-8 wearing six carburetors. Chrome trim that could be saved was straightened and re-plated. The custom red-and-white interior from the movie was carefully pulled out, repaired, re-dyed, and reinstalled. The crocheted dice hanging from the mirror were faithfully recreated, as was the cardboard license plate from the film. Actress Candy Clark, who spent as much screen time riding in the Impala as anyone, helped Evernham unveil it at the 2016 SEMA show in Las Vegas.